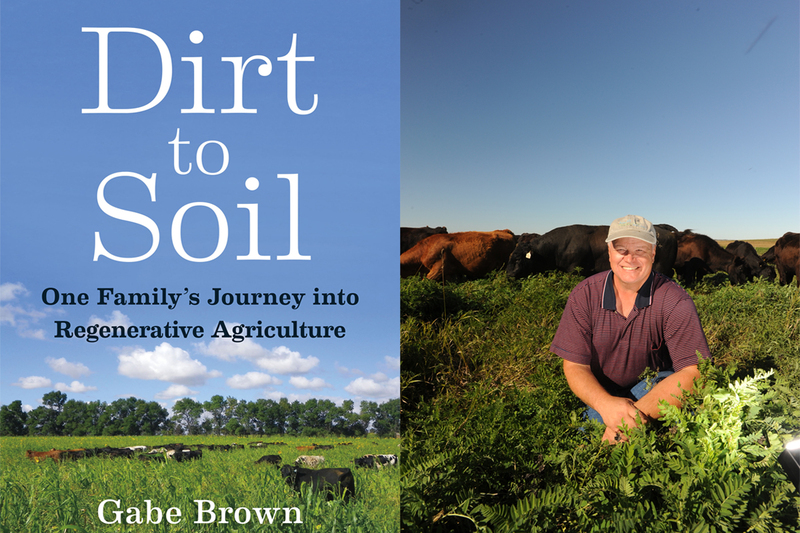 In his new book, North Dakota farmer Gabe Brown writes that saying no to government aid has allowed him to take control of his ranching—in good and hard times. 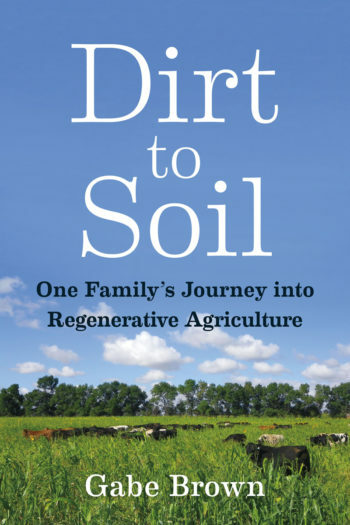 The following is an excerpt from Dirt to Soil: One Family’s Journey into Regenerative Agriculture (Chelsea Green Publishing, 2018) and is printed with permission from the publisher. Brown and his family own Brown’s Ranch, a holistic, diversified 5,000-acre farm and ranch near Bismarck, North Dakota. The federal crop insurance program was instituted on February 16, 1938. As with most government programs, good intentions often lead to disappointing results. A program that was intended to minimize risk has become a monster that now dictates most of the cropping decisions made in the United States today. In my opinion, this program also ensured that low commodity prices would be the norm for decades to come. I contend that over 95 percent of planting decisions farmers make today are based on how much money they can guarantee themselves by insuring through crop insurance programs. Farmers know exactly the minimum amount of gross dollars per acre they will receive that year from crop insurance. Keep your expenses below that amount and you will make a profit. What other business is offered those guarantees? Certainly not Ma and Pa’s restaurant on Main Street! This also drives input suppliers to charge more for their products because they know that farmers are guaranteed this revenue stream. Thus, the suppliers charge what they know farmers can pay in order to ensure their own healthy profitability. Fertilizer, herbicides, pesticides, fungicides, equipment—and the list goes on—all continue to increase in price. I can always tell when a local fertilizer or chemical dealer hires a new salesman, because I get a visit from the newbie. I notice that many of these folks drive brand new pickup trucks. Where does the money come from to buy all those new pickups? The profit offered by revenue insurance is quickly gobbled up by industry. Tighter and tighter margins mean that producers are more reliant on the subsidies provided by government programs—programs such as crop insurance, the Environmental Quality Incentives Program (EQIP), the Conservation Security Program (CSP), and a myriad of other acronyms. I took advantage of these programs for many years. I received cost share for tree plantings, fences, wells, even auto-steer for my tractor! I didn’t give it much thought—early on, anyway. But as I started thinking holistically, as I began to realize the ramifications of taking advantage of these programs, I began to have serious reservations about accepting that cost share. Ma and Pa’s restaurant on Main Street was not getting their insurance premium subsidized. My relatives who live in town had to purchase trees from the nursery at full price; they were not eligible for cost share. What entitled me to receive this money? Again, I was told it was because I was “feeding the world.” But the more I thought about it, the more it seemed to me that these payments were just a form of welfare, and I did not want welfare! Shelly, Paul, and I made the decision that we would no longer accept any agricultural payments. No crop insurance subsidies, no EQIP, no CSP. Period. Fall-seeded cover crop of oats, peas, lentils, and daikon radish is “capturing” sunlight on Brown’s farm. I found that decision very liberating. I no longer have to spend time at an Natural Resources Conservation Services (NRCS) or Farm Service Agency (FSA) office filling out forms. And more important, I am free to make cropping and other management decisions that are in the best interest of my ranch and my family. I’m no longer “tied” to decisions based on what someone else thinks is best. 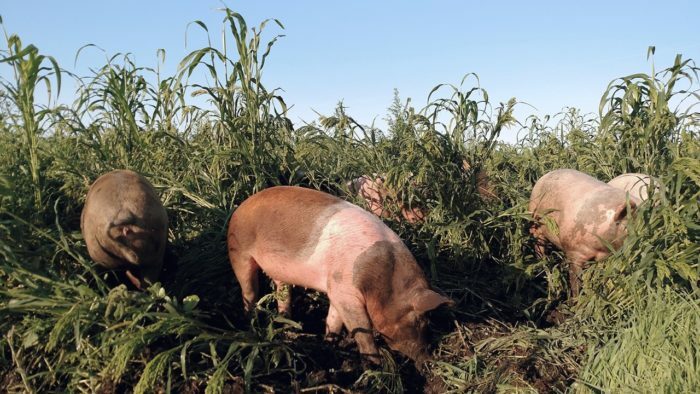 Don’t get me wrong: I believe a case can be made for some government programs, especially ones geared to helping young producers or our military service veterans enter regenerative agriculture. I just believe it is inherently wrong to routinely use hard-earned taxpayer dollars to subsidize agriculture—or any other business for that matter. A good case in point was the summer of 2017. Here in North Dakota, we did not receive our usual spring rains and the weather turned hot. In early June we had several days in a row over 100°F (38°C), and then, less than forty-eight hours later, it froze! This combination took its toll on forage production. Many producers scrambled to find enough forage for their animals and ended up traveling hundreds of miles to find grazing land or to buy hay. Thousands of cattle were sold off. One of my neighbors had his cattle out on pasture less than two months before he had to start giving them supplemental feed. His pasture looked like a well-groomed golf course! A disaster declaration was made, and the government started the money train flowing. Producers were encouraged to sign up for this disaster assistance. I was asked to do likewise. “Why?” I asked. Due to our adoption of Holistic Planned Grazing, we had seen few ill effects. We grazed just as many animals as we had the previous year, but I adapted my grazing strategy accordingly. I stopped moving the cattle every day, thus allowing them to eat more of the forage. This ensured that I would have forage to move them to. The fact that our pastures had strong root systems and plenty of armor (i.e. roots) covering the soil helped tremendously. The years spent focusing on creating a healthy ecosystem paid dividends. It had made my pastures resilient to one-year swings in precipitation and temperature. I could have collected tens of thousands of dollars simply by walking into the FSA office and signing my name on a form. But I just could not morally or ethically do that. We simply did not have a disaster on our operation. I see what happened in North Dakota as less a natural disaster and more a human-caused disaster resulting from poor management. If our agricultural system had not caused a huge drop in soil organic matter over time, our farms and ranches would be much more resilient in times when rainfall does not come through. 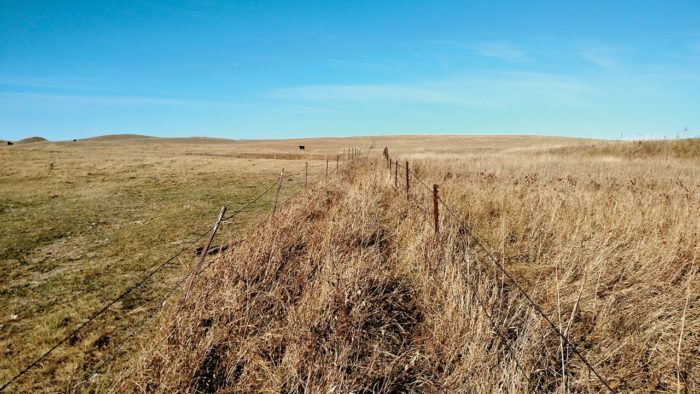 This fence line comparison shows the difference between a pasture belonging to a neighbor that has been grazed all season long, and one of Brown’s pastures that was grazed using an adaptive multi-paddock approach. As I look back and think of all the practices I received subsidies for, I can honestly say that if I had it to do over again, I would not make the same choices the same way again. Let me give you an example. We received a lot of cost-share dollars for fencing. We built over 100 paddocks on our ranch using permanent fencing. We are now tearing out nearly all of those fences! Too many acres are either under or alongside the fence, and we are not able to get the hoof impact alongside and under the permanent fences. meaning that soil health and forage production suffer. 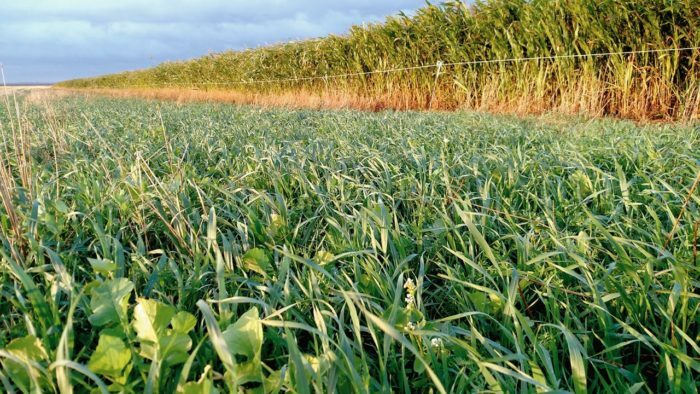 If we were to use temporary electric fence instead, we could move to a different location each year, thus allowing the animal impact soil needs on every square foot of our pastures. All of that expensive permanent electric fence was a waste of my time and a waste of taxpayer dollars! Agencies such as NRCS are trying to do the right thing, but it would be a better use of money and staff time if they would educate producers about how ecosystems function. They should be providing the technical expertise that is sorely needed, instead of overseeing programs that end up being nothing more than entitlements. How much of our federal debt crisis could be avoided if the government phased out such ineffective programs? I know many NRCS employees who are excellent teachers and who could make a much greater impact educating farmers and ranchers, which, in turn, would lead to a much greater financial reward for the farmer or rancher than do those cost share practices. Those employees would much rather devote their time and talents to educating growers than to overseeing programs. A man using his brain stem! More money does not equal wisdom. Thanks Gabe.........for your wisdom, ethics and good decision. The biggest problem is that the value of subsidies, including protection from real estate taxes, is capitalized into higher farmland prices. If a farmer can get $1 million in subsidies, the value of the farmland increases by $15 to $20 million. Property tax protections are even worse, because those protections often go to land speculators who are merely posing as farmers. In some states (Florida, for example), there are "rent a cow" companies that will charge you to let them graze cattle on your vacant land so you can get special farmer assessments. Someone who wants to go into farming has to pay an inflated price, not only to actual farmers, but to speculators who are only farming the tax codes. Professor Mason Gaffney, a specialist in land and mineral economics, has documented how these tax breaks have actually given corporate agribusiness and "hobby farms" a competitive advantage over full-time family farms. Thanks for publishing this article. Having worked for and with the Department of Agriculture for a number of years I have seen many of the same issues and challenges. As far as I can tell programs and policies that are developed and ran by Federal bureaucracies are largely neither effective or efficient where effectiveness is defined as "doing the right thing and efficient is doing things right". Gabe has led by example on this topic and I for one I taking steps to walk the walk for many of the examples that were sited.